Six-guns and space ships! Cowboys and aliens! Gunfights at the OK Corral on Mars! 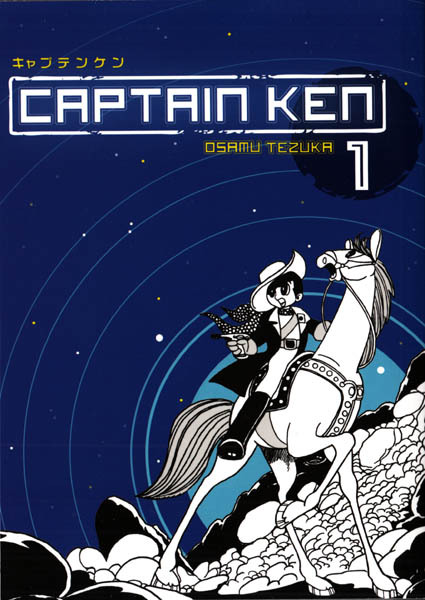 It’s all happening in Digital Manga’s release of Captain Ken, a tremendously entertaining Osamu Tezuka manga that mixes classic Western action with classic pulp sci-fi. Captain Ken delivers a satisfying space chuckwagon full of the best of both worlds, as the mysterious Japanese space-cowboy Ken’s mission of mercy puts him in the middle of Martian range-wars, a genocidal extermination plot, and the political corruption of two planets. 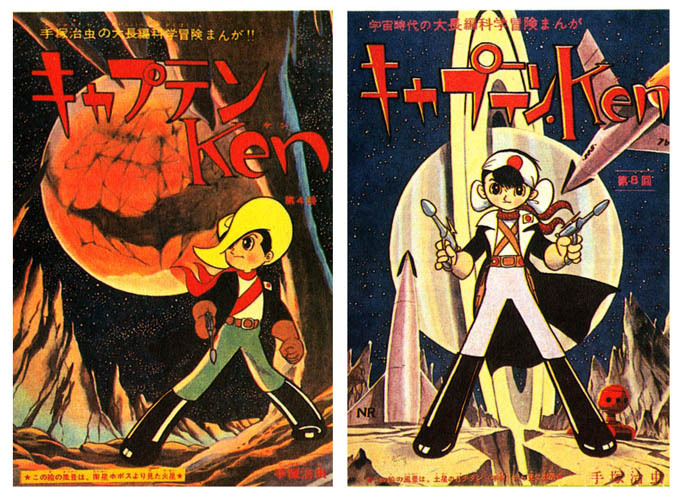 The juxtaposition of Wild West and Outer Space wasn't a new motif when Captain Ken first appeared in a December 1960 issue of Shonen Sunday. Years before JFK invoked "New Frontier" imagery for his 1960 presidential campaign, the idea that space travel would be our next frontier was commonplace. The crude SF of the "golden age" was often criticized as merely retooled Westerns, with Martians replacing Indians, spaceships swapped with horses or trains, and atom-guns instead of six-shooters. The space-western motif would headline Charlton’s abortive 1952 "Space Western Comics", featuring hero Spurs Jackson and his Space Vigilantes battling saucer-men, Venusians, and, of course, Hitler. Mixing space opera and horse opera might have been old (cowboy) hat even in 1960, but with Captain Ken, the godlike talent of master manga-ka Osamu Tezuka took those two clichés and spun them into rock-solid manga entertainment for the rocket-ship rancher in us all. It’s the Wild West Future! Mars has been colonized into a simulacrum of the 19th century Old West by Earth settlers who have nearly wiped out the native Martians. Destruction for the last native Martians looms as they gather strength for a last revolt while the Earth government plans their final solution. The Earthling girl Kenn Murakami arrives on Mars to live with her cousin Mamoru at the Hoshino ranch in the Mars town of Hedes, just as the last Martian tribe, the Moro, begin their guerilla war. Battling Moro braves in the midst of a sandstorm, Mamoru Hoshino meets the mysterious Ken, a sharpshooting cowboy with a fantastic robot horse. Is the demure Kenn actually cowboy Ken in disguise? If not, why are their features so similar? The early part of the story is taken up with this is-he-or-isn’t-he business, sandwiched between sweeping Martian vistas, robot horse stampedes, craven mayors, and Martian-style shootouts. 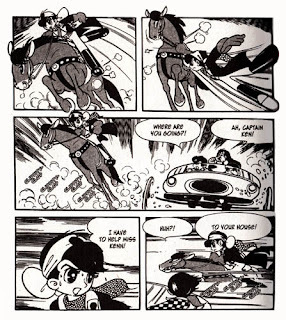 Plenty of Tezuka’s signature sight gags leaven the rivalry between Mamoru and Captain Ken as they both defend the Hoshino ranch and Kenn from vengeful Moros and corrupt Earthling officials alike. 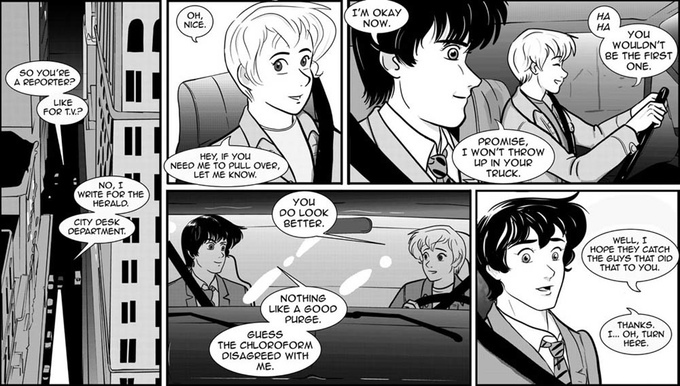 Captured by the corrupt, treasure-hoarding mayor and sent to a Martian labor camp, Ken befriends Papillon, a Moro girl who also has an amazing secret. The evil President Slurry executes his master plan – the detonation of a Solar Bomb to exterminate the native Martians once and for all. 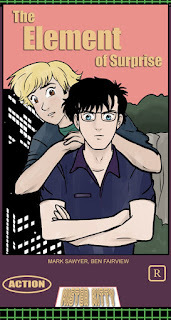 Can Ken and Mamoru stop the destruction? 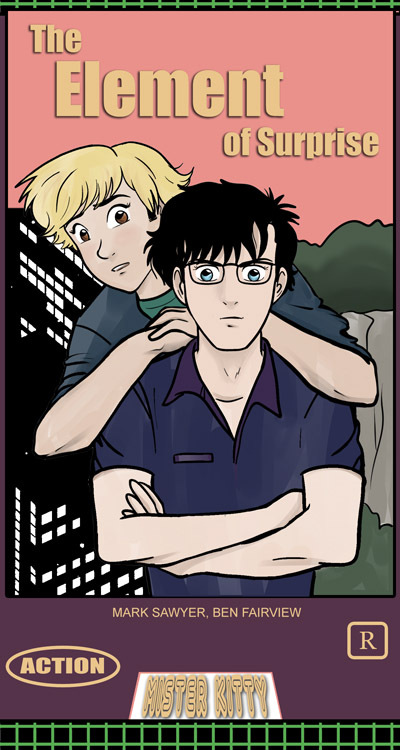 What is Captain Ken’s true relation to Kenn and how does it tie into his astonishing true identity? Will he master the Martian gunfighting style and defeat the evil black-clad gunslinger Lamp, and will Ken and Papillon together meet their destiny? Captain Ken is well stocked with secret treasure hoards, low-gravity Mars-orbit swordfighting, giant-wheeled Martian prairie schooners, lonely hermits who are secret masters of “Martian-style gunfighting”, and the evil Napoleon, crime-lord of all Mars, whose real identity is but one more switcheroo in the polymorphously perverse Tezuka parade of dual characters, shape-shifting Martian monsters, implied cross-species romances, and gender-bending disguises that make up a curiously large part of his body of work. Tezuka-brand social commentary is front and center, spotlighting Manifest (Space) Destiny’s affect on indigenous peoples; whether Indians or Martians, the people who were there first always seem to get the short end of the stick. It’s no coincidence that the last remaining Martian tribe is the Moro, deliberately echoing the Muslim Moro tribes of the Philippines, who fought both Spanish and American soldiers during the Philippines’ days as a colony of both nations (Japan has its own colonialist history in that neighborhood, but such things are at this time beyond the scope of Tezuka’s thesis or that of his editorial staff, sorry). Though not as successful as his previous Shonen Sunday serial, the proto-furry Cold War allegory Zero Men, Captain Ken was popular enough to garner a deluge of responses to a “Guess Captain Ken’s Real Identity” contest. Coincidentally, one of the two winners later went on to animate at Tezuka’s Mushi Productions. 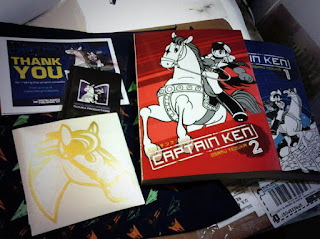 Captain Ken would remain on the Tezuka midlist dude-ranch, being neither as iconic or as merchandise-friendly as Tezuka’s earlier Mighty Atom or Jungle Emperor, nor as challenging or as experimental as his later works. Yet Captain Ken utterly nails that late 50s-early 60s pulp science-fiction action/adventure vibe – the kind of story every mid-century cheap paperback cover, movie poster, or lunchbox illustration promises us and yet never delivers. Ken is a beautifully rendered tale of adventure, excitement, and mystery, shot through with thoughtful science-fiction concepts and a time paradox reveal that poses more questions than it answers. It’s the kind of satisfying juvenile SF that would be a crowning achievement for other creators, yet for one as protean as Tezuka, it’s merely Tuesday. There’s a lot to unpack in the 440 pages of Captain Ken’s two volumes, but the story never bogs down or gets sidetracked by info-dumps. 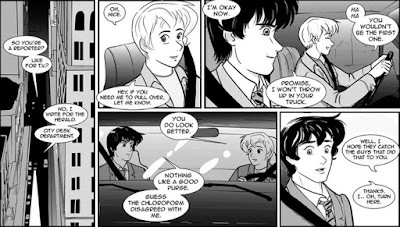 Even the third-act temporal displacement is delivered with finesse, a twist that would echo similar hooks in later SF and itself was admittedly inspired by Robert Heinlein’s 1959 story “All You Zombies” (Heinlein and Tezuka would meet in 1982 at Go Nagai’s wedding). 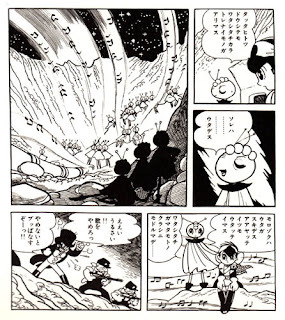 The clarity of Tezuka’s pen work matches his story; both the rugged Martian landscape and the cartoony characters that inhabit it are confidently drawn, and breeze through the story with all the vitality and movement Tezuka’s comics were famous for. Digital Manga has released Captain Ken in a fine 2-volume softcover set, crowdfunded by Kickstarter, as is the case with most of their Tezuka releases. Depending on their donation level, backers could receive Captain Ken in print or digital or both, along with goodies like decals, bandannas, messenger bags, etc. For those who missed the campaign, the books are available through more traditional methods, as well. 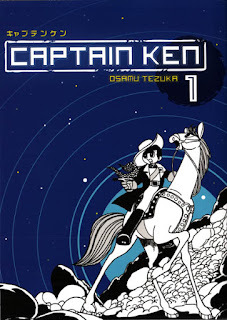 Captain Ken delivers two-gun space western action that fits neatly in your robot horse saddlebags and should appeal to fans of anime, of manga, of science-fiction, of westerns, of pop-culture mashups and adventure in general, in short, pretty much everybody. 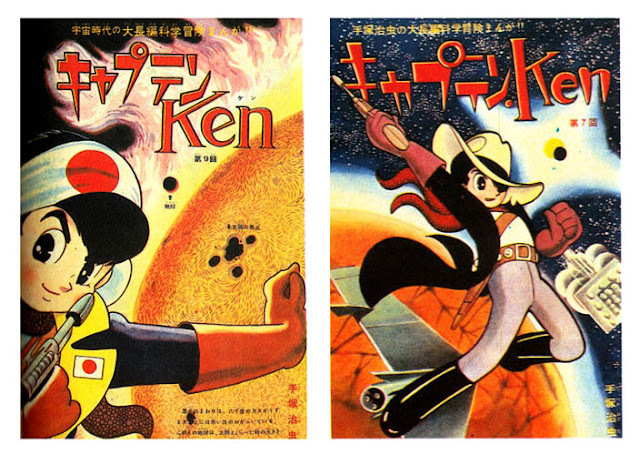 It may be one of Osamu Tezuka’s minor works, but Captain Ken is major manga entertainment.